Walter Adolph Georg Gropius was a German architect who founded the Bauhaus School, a school in Germany that combined crafts and the fine arts. He started his career as an employee with the firm of Peter Behrens, with fellow employees Ludwig Mies van der Rohe, Le Corbusier, and Dietrich Marcks. In 1910, Gropius left the firm of Behrens and established a practice in Berlin with his fellow employee Adolf Meyer. Together they share credit for one of the seminal modernist buildings created during this period: the Faguswerk in Alfeld-an-der-Leine, Germany, a shoe last factory. The glass curtain walls of this building demonstrates the principle of modernist, reflect. In 1913, Gropius published an article about "The Development of Industrial Buildings," showcasing images of factories and grain elevators in North America. This article had a strong influence on other European modernists, including Le Corbusier and Erich Mendelsohn, both reprinted Gropius's grain elevator pictures between 1920 and 1930. During his career in Bauhaus School, products such as the armchair F 51, designed for the Bauhaus's directors room in 1920 and nowadays a re-edition in the market, were rapidly produced. In 1923, Gropius designed his famous door handles, one of the most influential designs from Bauhaus, and an icon of 20th-century design. He also designed large-scale housing projects in Berlin, Karlsruhe and Dessau in 1926-32, contributions to the New Objectivity movement. Before World War II began, Gropius left Nazi Germany in 1934 with the help of the English architect Maxwell Fry, on the pretext of making a temporary visit to Britain. He moved on to the United States in 1937, bringing influence of International Modernism to the U.S. With the house he built for himself in Lincoln, Massachusetts that is now called Gropius House. He later moved to Cambridge, Massachusetts to teach at the Harvard Graduate School of Design and collaborate on projects including The Alan I W Frank House in Pittsburgh and the company town Aluminum City Terrace project in New Kensington, Pennsylvania. In 1945, Gropius founded The Architects' Collaborative (TAC) based in Cambridge with a group of younger architects, later becoming one of the most well-known and respected architectural firms in the world. Gropius later died at age 86 in 1969. Unfortunately for TAC, it was unable to pay expenses it owed and was closed in April of 1995. Gropius, along with Ludwig Mies van der Rohe, Le Corbusier and Oscar Niemeyer, is widely regarded as one of the pioneering masters of modern architecture. He was remembered not only by his various buildings but also by the district of Gropiusstadt in Berlin. 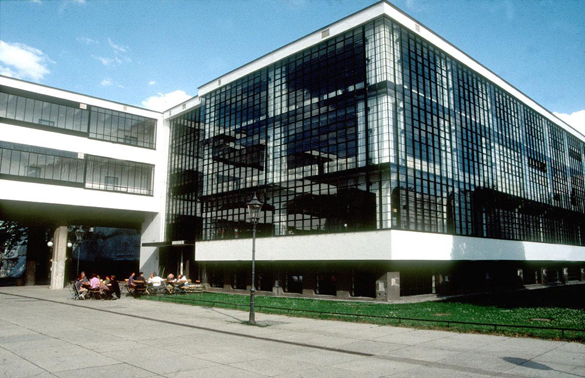 The Bauhaus (Weimar, Germany) was a school where students received theoretical and practical training in all of the fine arts like ceramics, murals, stained glass, typography, metalwork, book binding, stone sculpture and furniture making.